Take care of your appliances and your appliances will take care of you. It makes sense, doesn’t it? After laying out who-knows-how-many-hundreds-of-dollars on a new fridge, the last thing that you want to do is have it break on you after only three years of use. So you take care of it. And being frugal means that you take care of it yourself! I recently defrosted my refrigerator, as the freezer was starting to look like the photo above. Not only that, but we were frequently finding pools of water underneath the vegetable drawers. My fridge is still under warranty, but I decided to do some basic things first, before calling in a repair person, and possibly paying an outrageous charge. So I emptied out the fridge and freezer (read about the strange things we ate on Almost Frugal Food) and then I unplugged it for a day. The ice slowly melted away, and the ensuing puddles gave me an unexpected frugal benefit: water with which I could mop the kitchen floor! Appliance repair, tips and help from Repair Clinic.com. Also from repair Clinic comes an annual maintenance schedule for your basic home appliances. Service Magic has some troubleshooting tips. In general, I find that keeping things clean and dry is the best preventative maintenance that I am capable of- and it works. I leave the lid on my washing machine open when it’s not in use and wipe the lid down with white vinegar every so often on a rigorous schedule to get any gunk off. I wipe up any spills on the dishwasher when they happen, and I vacuum behind the fridge a few times a year. One of the best ways to clean a microwave is buy microwaving a wet sponge for a few seconds- this loosens any caked on food and then the warm sponge is better able to get it off. And finally what list of frugal cleaning advice would be complete without… vinegar! It’s wonderful at getting grease off, mold out, and calcite buildup from forming. When did you last defrost your fridge? It might be time to think about doing it! 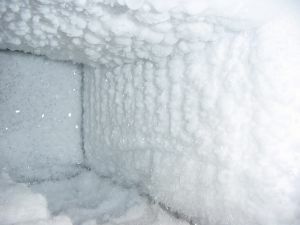 Most refrigerators sold now automatically defrost. However, I do have a stand-up deep freeze that requires defrosting. I’m not sure why, but it builds up ice very quickly, and since that freeze holds clearance-purchased and bulk meats as well as several hundred ounces of breastmilk, it needs to work properly. I defrost it about twice a year, packing all the food into coolers or boxes packed with newspaper. I put a pan of hot water in there for awhile with the door closed, and then blast off the thickest stuff with a well-aimed hair dryer. Usually takes about 2 hours, start to finish. Great advice…and thanks for the reminder…I should defrost my freezer! The inside of my freezer is starting to look like the photo too. 🙂 Winter is probably a good time to do it, because then you can safely remove your frozen items and keep them frozen outside if you need a lot of time to defrost. I like that about the washing machine lid–no rust = none of those mysterious rust spots on the laundry. You make excellent sense. Thanks for the reminders. EXCELLENT advice! You just highlighted something very important that I missed on my most recent post. May I link you? @Ms Liz, of course you can link to me.